Last week Regan and I headed to black market for dinner. It’s a lovely little restaurant at the end of Mass Ave and many of their dishes highlight something pickled or preserved. We started with the Pickle Plate and with that first bite of pickled green bean and peanut butter we were hooked. Yes. Pickles and peanut butter are in fact a thing. Just ask my mom — we never had a shortage of either, and even though I don’t remember her eating peanut butter and pickle sandwiches much as I got older, there was a good chunk of time during the mid 80s to early 90s where I remember that being a regular occurrence. And for the record, my brother was born in ’86 and my sister in ’90. These pregnancies may or may not have impacted the frequency of mom’s pickle and peanut butter eating. At any rate, this visit to black market got me fixated on pickling and canning so when one of my college roommates and best buddies ever, Patti, suggested another creative retreat after the success of our last get together, I suggested we pickle. However, I’m not good about diving right into things I don’t fully understand and I’m a little worried about killing myself in the kitchen (botulism), so we started out very simply. We gave refrigerator pickling a try. 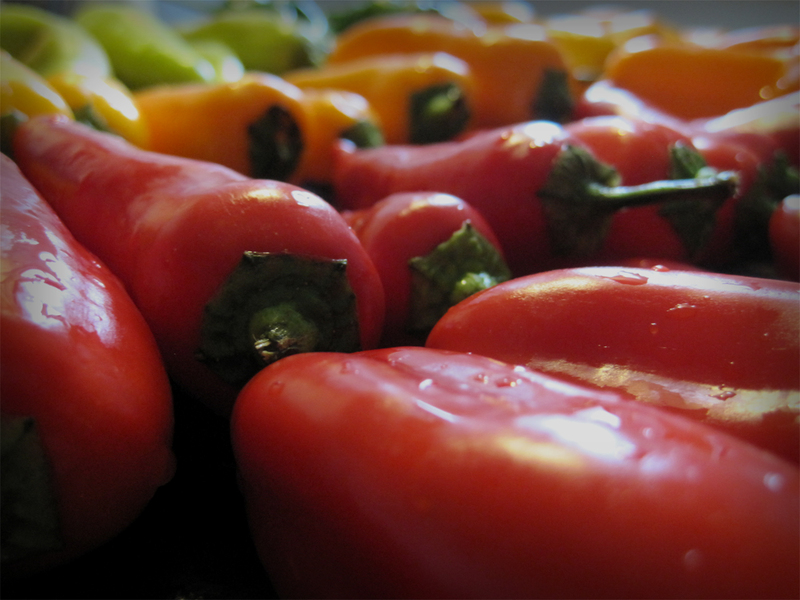 Three pounds of green beans, four pounds of carrots, four pounds of apples and two pounds of sweet peppers were washed, prepped, brined and jarred on Saturday. When we tackle projects, we go big. If Patti and I lived a little closer we’d be the most productive people ever. And we’d probably be really happy all the time. We make a really good (fun) team. A morning visit to the Binford Farmers’ Market followed by prep time back home, then an afternoon baby shower followed by seven straight hours in the kitchen baking bread, making a decadent dinner and pickling in between tasks rounded out our day. At midnight with our jars neatly lined up on the kitchen table, Regan was kind enough to come out and take photos of our finished product while we giddily looked on, so proud of what we’d accomplished. Next on my list is true pickling and canning. If this weekend was any indication of how fun it can be, it’s worth getting over some of my fears and jumping right in. 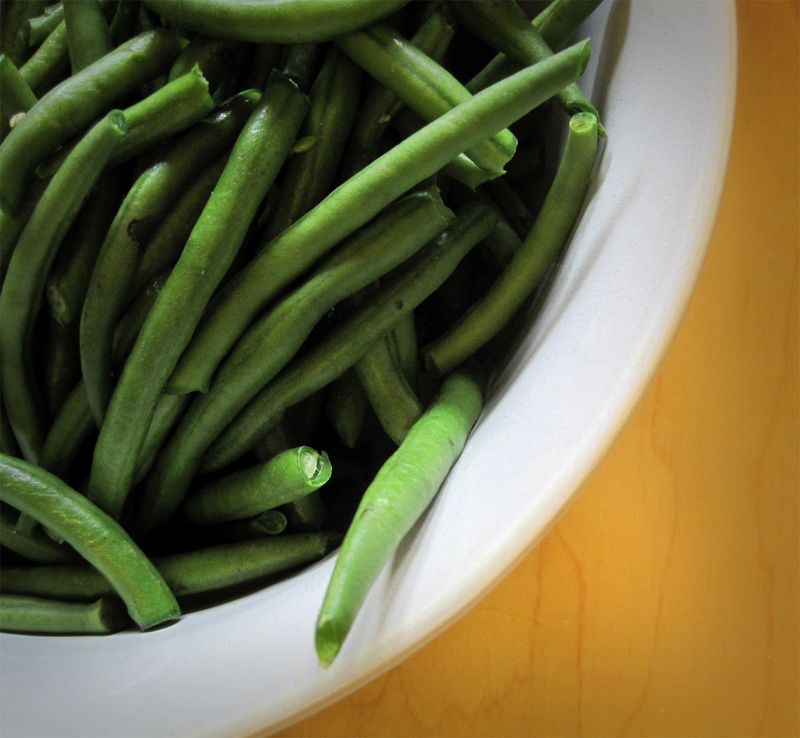 It’d be nice to have some veggies with a shelf life. Here are the recipes we used, although we adjusted them for higher quantities. 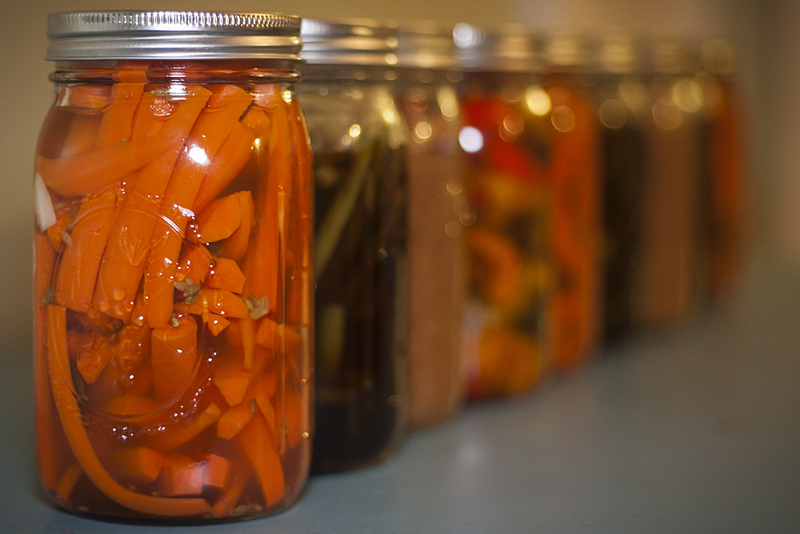 What’s been your most successful pickling recipe? Look great! I never would have had a clue about pickling if it had not been for all those years at the Tinsley House and a massive vegetable garden that would go to waste if it were not for vinegar and jars. It’s been a while since I did any “real” canning, but it’s not too hard. Maybe when I get back to the USA we can try some together. It’s definitely a two person job. I also made the carrot pickles with the last baby carrots from our garden. I tried one and really liked it, but after putting one in Frank’s mouth, I got a grimace and a “uh, no, I wouldn’t be into that” from him. Maybe Irish folks just don’t “get” pickles, I dunno. But I thought it was good! Also used some extra brine for a jar of regular old cucumbers and it’s yummy too. I make pickled zucchini relish. It is as tasty as that made from cucumbers and give me something to make with the baseball bat size squash that appear in my garden, well-hidden under big leaves. Relish sounds great! And considering how incredibly prolific zucchini seems to be it’s nice to find a tasty use for it. Thanks! That all looks so delicious…so talented Miss Claire!